Lots of family time = lots of talking. And, usually about super fun topics like your dating life or plans for having children. Unless you are in my family. I’m pretty sure my mother will use the opportunity to tell us everything she has learned from Dr. Oz. She’s slightly obsessed…she even takes notes from his show! 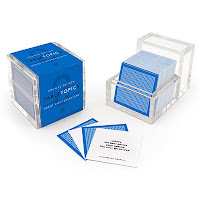 I think I’ll bring the Table Topics Family Gathering Edition cards to her house. Or, at least some of the sample cards from their site.